There are a bunch of plugins out there that will translate a website with the push of a button. For Firefox, the Wiktionary and Google Translate add-on works great. If you use Google Chrome (which comes with Android phones), it comes with a translator. Safari also has a translator here, but for iPad or iPhone you’ll probably want the Bing App (cause Apple hates Google). This site will give you the info you need to install and use it. Last and certainly least, Internet Explorer allows the Google Toolbar plugin, which comes with a translator. Once you’ve got a translator installed, you can decipher the sites that only the locals use, which makes it much easier to find the places that only the locals use, and it gives you a better insight into the culture overall. Vietnam’s budget airline. I check the site regularly for deals. Sometimes you can get a flight that will save you a day on a bus, but only cost you $20 more. 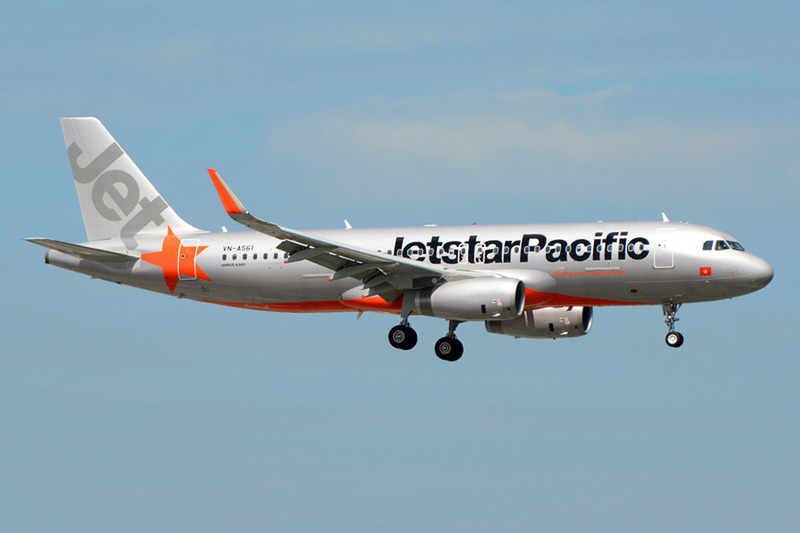 This Australian company has more locations outside of Vietnam than Vietjet, but also serves 16 airports in Vietnam. Their prices are usually pretty good and their planes are fairly new. Finally, Vietnam National Railways has its own site. It allows you to check for tickets, get times, see what seats are available, even buy the tickets. It’s everything you need for train travel in Vietnam. This is one of the better bus companies in Vietnam. Their site isn’t the best, but it’s better than most Vietnamese bus company websites. If you want to check the bus schedule and see how much it costs, you have to put in the city and dates, then fill in all your information (I usually just mash the keys, unless I’m actually planning on buying the ticket). The best part about FUTA is that they’ll sometimes pick you up from your hotel. You have to call, or get someone who speaks Vietnamese to call. The number is 1900 6067. Mai Linh is another good bus company. They are the same company that owns the green taxis. Their site is only in Vietnamese, but you can check the prices here and the schedule here. This is a popular bus company with backpackers. I usually avoid it, only because I prefer to travel with locals, but they have a good website that’s in English and their prices are pretty good. You can book open bus tickets with them as well. For their prices and to order online, see this page. A sleeper bus and a gorgeous head of hair. If you can’t find anything with those companies, you can try this new Vietnamese startup that lists bus options to/from any Vietnamese city. Again, it’s only in Vietnamese, but it’s pretty self-explanatory. If you use your translator, you’ll see that it tells you the name of the bus company, the time it leaves and arrives (you can change the time by clicking the little arrow), how many and what type of seats the vehicle has, reviews from past users, and the cost. This is a great way to save a buck. You can book a seat on the site, or just use it to figure out what your options are, then head to the station to catch it. If you are going off the tourist trail, this site will help you get to those hard to reach places (kind of like a back scrubber). Uber is available in Vietnam. It doesn’t cover every city, but it’s worth getting the app and checking it whenever you’re in the need of a ride. More and more Uber drivers are popping up everyday, and this app can save you serious money in Vietnam. Unlike other countries, Uber in Vietnam is much cheaper than a regular taxi. 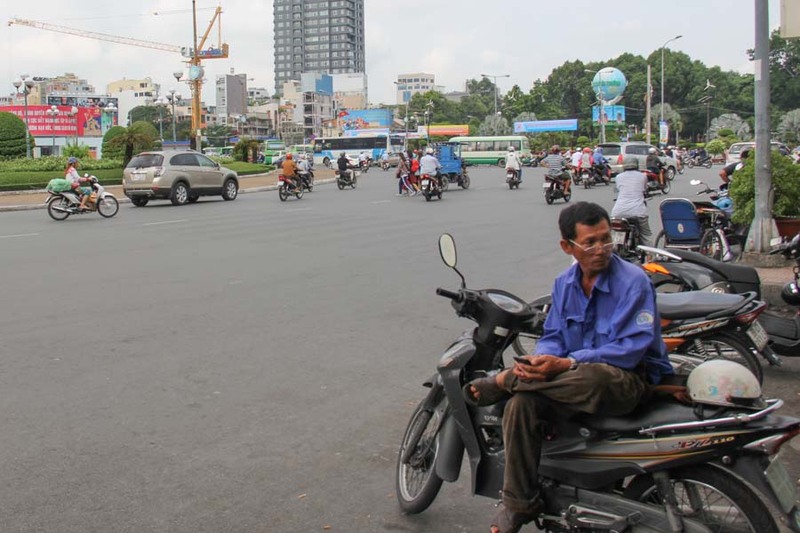 I’ve taken rides that normally cost me 500,000 VND for only 380,000 VND. That’s a big difference — like 9 beers worth of difference. If you aren’t signed up for Uber yet, please use this link (my referral link). You’ll get 50,000 VND to go towards your first ride. My ex-bikefriend, Buzz. A 1969 Honda Cub. This site is for selling and renting things to other travelers, but pretty much the only thing you ever see on it is bikes. You can use it to find a motorbike rental or to buy one. Most of the bikes have been used by other travelers, some have been ridden from Hanoi to Saigon, or vice versa. 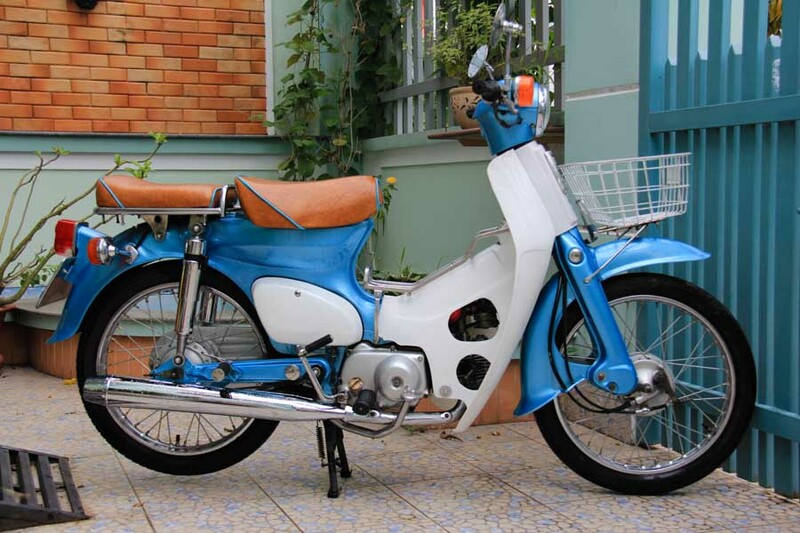 For more details about buying a bike in Vietnam check out my guide. They probably cover more hotels than any other booking site in Southeast Asia. They also provide reviews and decent photos, so even if you aren’t booking ahead, it doesn’t hurt to check out a few options on Agoda. This app allows you to book last minute hotels at a discounted rate. It’s pretty fun to use and it can save you a lot of money, specially if you feel like splurging for a night or two. If you decide to go this route, please save yourself some money and use my referral code. After downloading the app, go to “Credits”, click “Redeem”, and enter RNEMU. You should get 400,000 dong in credits (which is pretty close to a free night in a hotel). Delicious bowl of mi quang. If you find yourself in a restaurant that doesn’t have an English menu, this site will come in handy. You can look up the dish alphabetically, or you can search for it. Not all menus list items the same. As a simple example, if you search for “crispy fried chicken”, you might not find the profile for fried chicken because it might not necessarily contain the word “crispy”. The best thing to do is search a combination of words to get an idea of what the dish is. It doesn’t take a lot of Vietnamese to break down a menu. Usually menus are divided up by section, so if you can figure out what the section is you can figure out if you want a variation of that meat. 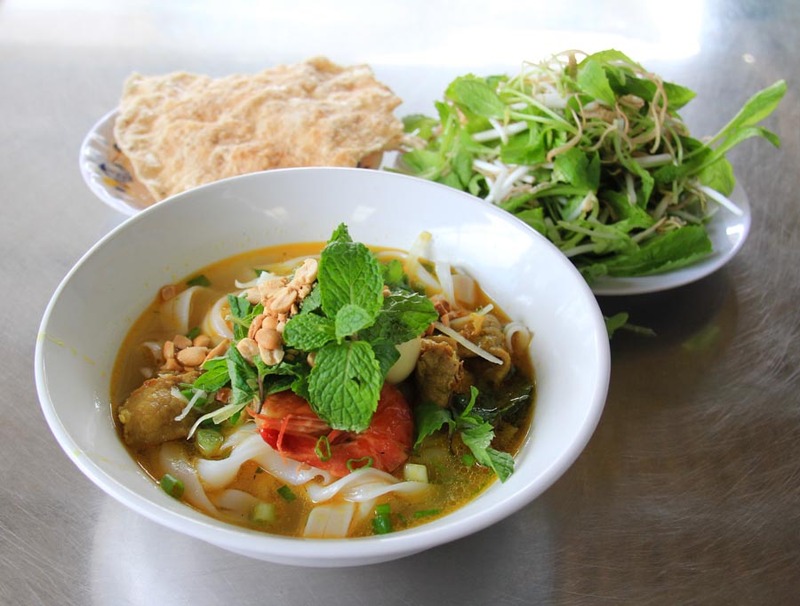 VietnaMenu will be adding dishes as its creator eats his way around Vietnam. How do I know this? Because I am the creator. Da da duuuuuum! This restaurant review site is available in English, but a lot of the reviews are in Vietnamese. They also have an app that’s probably worth getting for finding a restaurant on the go. With your GPS you can find what’s close, sort by proximity, and even look at a map that will help you get good directions. The site/app is used by a younger crowd, so many of the places that are well reviewed are university joints. Vietnamese youth love Korean culture, so there will often be highly rated Korean cafes and restaurants. Basically, it’s a good tool for finding what’s popular with the young crowd, in the same way Trip Advisor is good for finding what’s popular with the western crowd. I usually use a combination of the two sites, but when a place is very highly regarded on Foody, and isn’t even on Trip Advisor, I call that a find. This site is similar to Foody, but it doesn’t provide nearly as much information about the restaurants. You can search a specific area (in the top left corner), or click the little green button (by the red X) to find locations near you. I found a few places were marked wrong, but it’s still a decent tool that could come in handy if you find yourself in a place with no food in sight. Take out food is easy in Vietnam. Head to one of these site, pick your city, browse for food, select what you want, put in your address, pay by credit card, paypal, or cash upon delivery. Ask any expat and they’ll tell you these sites are a godsend. For a traveler, it’s probably better to go out and adventure to a restaurant, but the option to order-in is always a good one to have. When in Vietnam, why not add a little ‘nam to your daily blog browsing? Saigoneer has news, arts and culture, food reviews, and a fairly good events section. Whether you’re in Saigon or not, you’ll find some interesting things to read about the country and its culture. Similar to the Saigoneer, but Word also puts out a monthly magazine that’s informative, entertaining, and quite beautiful. If you prefer reading from paper, and have room in your backpack, pickup the latest issue at one of these locations. If there’s news in Vietnam, Tuoi Tre is usually the first place I hear about it. They’re a legitimate news site that have been providing English speakers up-to-date news for around for 5 years. Thanh Nien provides news on politics, business, sports, health, arts and culture, travel, and other adult topics. In a country that is very careful about the news they allow to be reported, Thanh Nien does a good job of letting the people know what’s going on in Vietnam. If you are going to be in Saigon or Hanoi, you should check out Ticket Box to see what events are going on. You can order the tickets online, or just use the site to get the information you need to go to the event. I’ve ordered tickets through them before and I found the service very good. I opted to have the tickets delivered and paid for them in cash when they arrived. No credit card necessary.